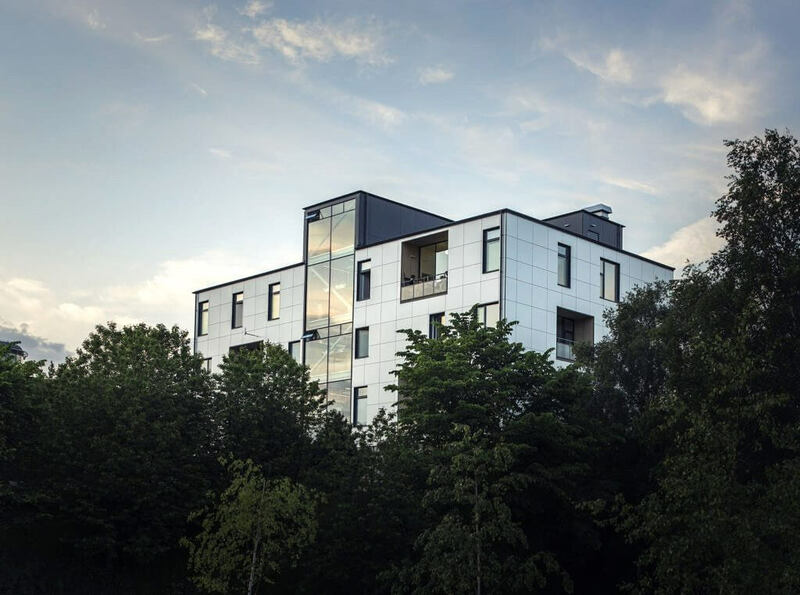 Monday 5 September 2016: A new Living Lab on sustainable housing of the future has opened its doors today: the HSB Living Lab in Gothenburg, Sweden. For the Climate-KIC flagship programme Building Technologies Accelerator (BTA), this is an important step in its pan-European network of Living Labs. Climate-KIC is Europe’s largest public-private partnership on climate change adaptation and mitigation. Working closely with several of the world’s leading research institutes, the BTA Living Labs offer real-life environments to develop, test and demonstrate clean building methods, processes and systems in a co-creation setting, with real estate owners and developers, construction companies and end users. With this approach, their day-to-day performance and actual climate impact can accurately be assessed. The realistic setting ensures that the solutions developed meet market needs, providing the real estate industry with innovative, financially attractive and viable building solutions. Living Labs provide the ideal environment to develop and demonstrate low-carbon solutions for new buildings as well as renovation projects. This allows a much faster market uptake of sustainable building innovations. The research for sustainable accommodation has been initiated. This was celebrated by researchers from all over the world, explaining their visions and goals. Helene Hellmark Knutsson, Minister for Higher Education and Research, delivered the inaugural speech, which highlighted the importance of the collaboration between industry and the academy. “The development of Swedish research is extremely central for the country. Through this good example of an open research arena, there are now opportunities for introducing important residential innovations on the market faster. It is my hope that more will take after this form of collaboration and invest in the future of good accommodation.” Helene Hellmark Knutsson. Almost 200 people visited HSB Living Lab at Chalmers in Gothenburg. They had the opportunity to take part in the research that is taking place in the experiment building. This included demonstrations of the future Laundry Studio, an integrated laundry and social area, and the new innovation BioBlender that separates water from kitchen compost and makes it possible to compost on your own balcony. There was a presentation of the building’s district heating return system, designed to save energy and money as well as the building’s interchangeable wall modules. “Thanks to the ability to test new wall systems as well as insulation and cladding materials for periods of up to ten years, we now have the best conditions for the successful development of sustainable solutions for the future. For me as a researcher, the interchangeable wall modules in HSB Living Lab are equivalent to the idea that we must have access to 120 houses to test on. It is a great opportunity.” Angela Sasic Kalagasidis, Associate Professor of Civil and Environmental Engineering at Chalmers University of Technology. The HSB Living Lab consists of twelve partners with a common focus on the accommodation. Partners are drawn from industry and academia, with an emphasis on collaboration. The setup of the Living Lab makes it possible to both obtain resources for a relevant research platform and to have access to knowledge and experience from other industries in the housing sector. “HSB was one of the first partners of Johanneberg Science Park. Along with co-owners and partners, we at Johanneberg Science Park, develop projects that give something extra than what can fit within traditional business activities. HSB Living Lab is a representative example. This project is an amazing journey and it is so exciting that now it has become a reality. A partnership of combined expertise will reinforce the involved partners, Chalmers research and provide students with a brand new arena for collaboration.” Mats Bergh, CEO, Johanneberg Science Park. During the autumn of 2016, at least fifteen research projects will be started up at the HSB Living Lab. The majority of new innovations should arrive within the course of one year. The purpose of HSB Living Lab is to create sustainable housing of the future, and the goal is to speed up the process of introducing accommodation innovations from the current 10 years to just two years. Building Technologies Accelerator (BTA) is a flagship programme under the Urban Transitions theme at Climate-KIC. As buildings account for a huge share of CO2 emissions in developed countries, the need for change within the building industry has never been clearer or more urgent. The introduction of new and sustainable technologies on a large scale, however, remains difficult. The BTA mission is to enhance large-scale implementation of low-carbon technologies and practices to meet carbon reduction targets in Europe, working towards liveable, zero-carbon and resilient cities. The BTA Living Lab network covers major climatic zones across Europe. The other BTA Living Labs are based in the Netherlands, Switzerland and Spain. Climate-KIC is the EU’s largest public private partnership addressing climate change through innovation to build a zero carbon economy. We address climate change across four priority themes: urban areas, land use, production systems, climate metrics and finance. Education is at the heart of these themes to inspire and empower the next generation of climate leaders. We run programmes for students, start-ups and innovators across Europe via centres in major cities, convening a community of the best people and organisations. Our approach starts with improving the way people live in cities. Our focus on industry creates the products required for a better living environment, and we look to optimise land use to produce the food people need. Climate-KIC is supported by the European Institute of Innovation and Technology (EIT), a body of the European Union.